Lovely but soggy ride to Castle Douglas to stay with Bev and Colin’s friends Jem and Jools. Despite having just got back from 4 days camp in the forest they instantly conjured up a party for a dozen assorted mates complete with a monster spread of food and lots of local musos. They played, we played we all ate and drank – proper job. 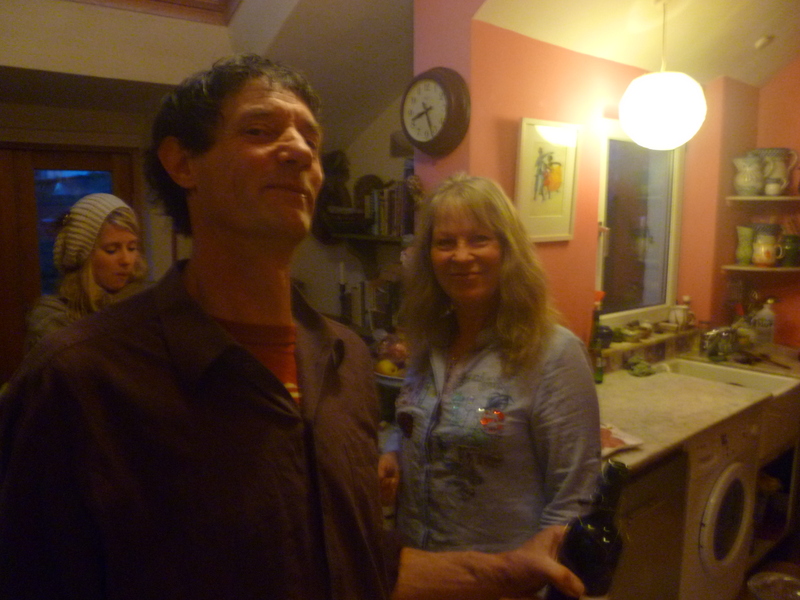 Among the musicians were Pete from Moishes Bagel and Ruth and Gavin from Bellview Rendezvous. Ruth was sporting the most unusual instrument a Nyckel Harp thet looked like a hurdy gurdy but sounded like a viola with reverb. We really enjoyed the whole affair and that was without the stunning breakfast. While moaning about the B&B full breakfasts I’d let slip that my all time fave breakfast was Effys Hay restaurant’s coddled eggs circa 1980 so I was made up when this appeared next morning. 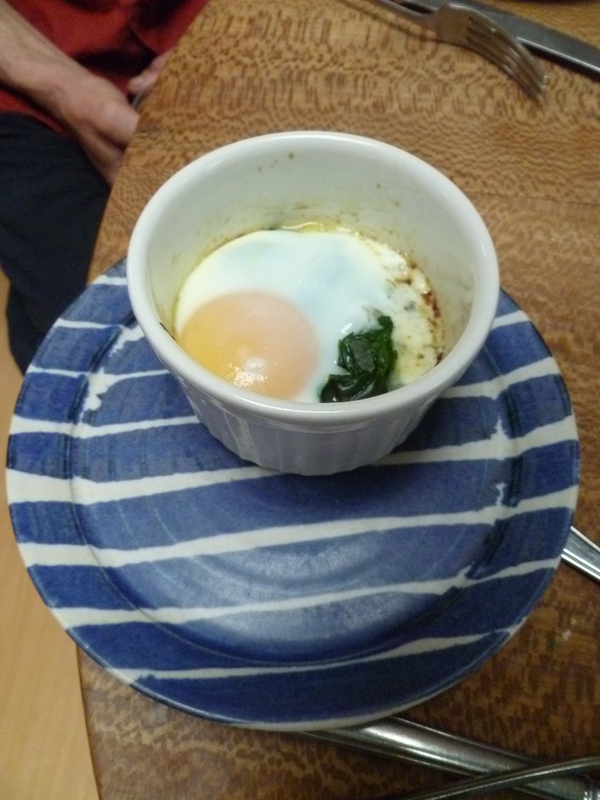 This sort of egg florentine is currently top of the charts for best breakfast of Rumba Ride. Saturday night and we are in Ayr which looks as pretty as next door Prestwick looks horrible. 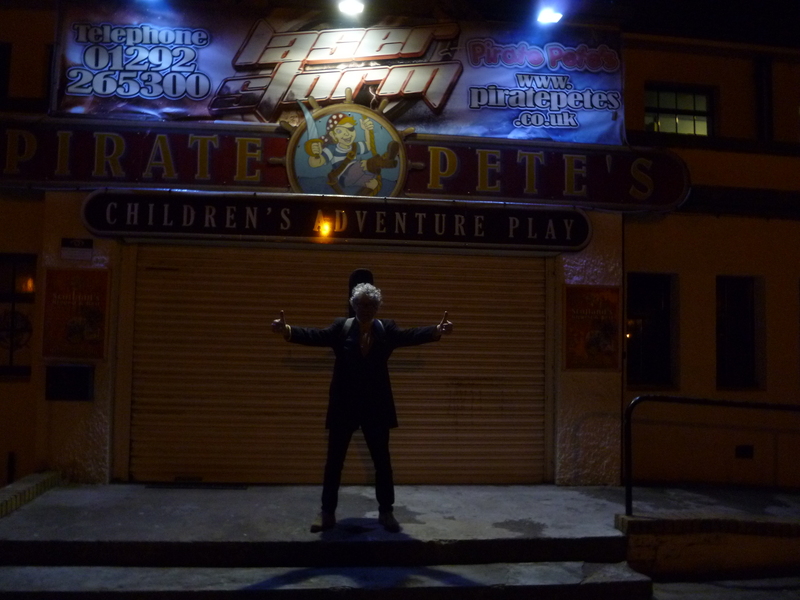 A fine spacious seaside town we easily find the gig ‘Su Casa’ but are told by Jamie who is organising it that we are playing at the Fire House instead. 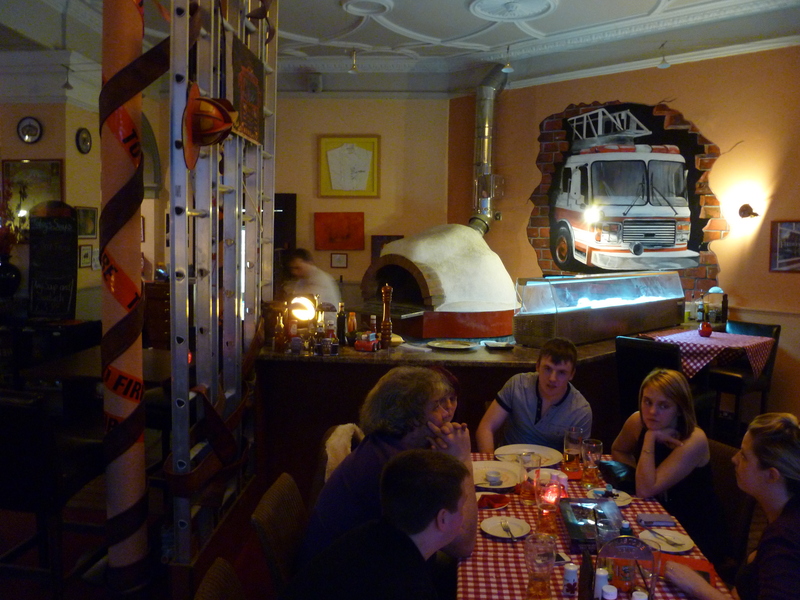 He seems a bit jumpy and when we roll up at the Fire House at 7 it is obvious why – no .one has a clue we’re coming, still its a nice place and we settle down to a very good wood fired pizza. At 9 the organisers Carol and Mark arrive and they dont know us from Adam. However they are very welcoming and explain its an open mic night and suggest we go on first.. The joint fills up with a jolly good homoured crowd although none of them seem to have instruments. 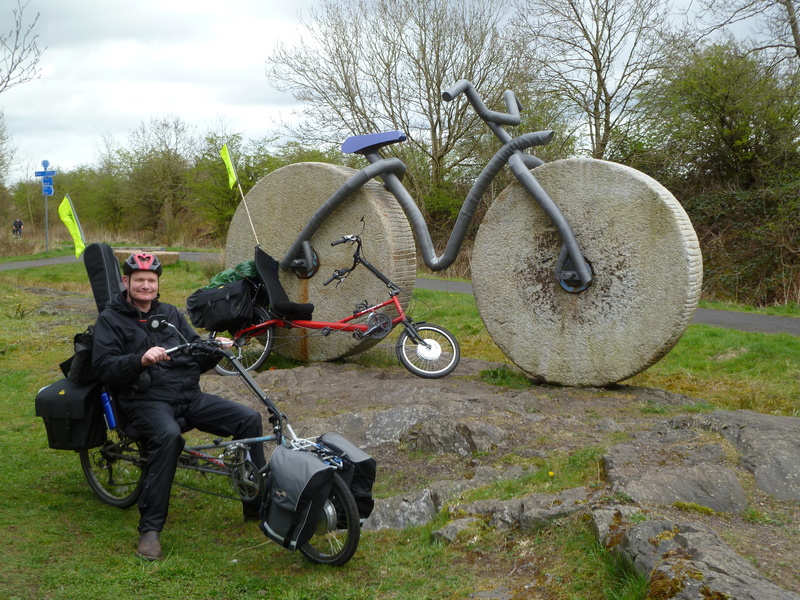 That was a bike ride to remember – all along Loch Lomond and then through the tortuous machinations of National cycle route 7 into Glasgow. The initial road round the Loch is hellish ‘You’re in for a treat down by the Lochside , cos everything smells of carbon monoxide’ but then it turns into a mighty cycle motorway and as you hit Dumbarton the route ducks and dives into the city via rivers, canals, parks, backsreets, bridges, pavements, playgrounds and old railway lines peppered with Stalag 9 type corrugated watchtowers that are apparently multi-storey racing pigeon coops. (silly me no pics of these crazy constructions). Any way whoever designed this route definitely deserves a knighthood it must have taken years to devise and it doesn’t stop in town . 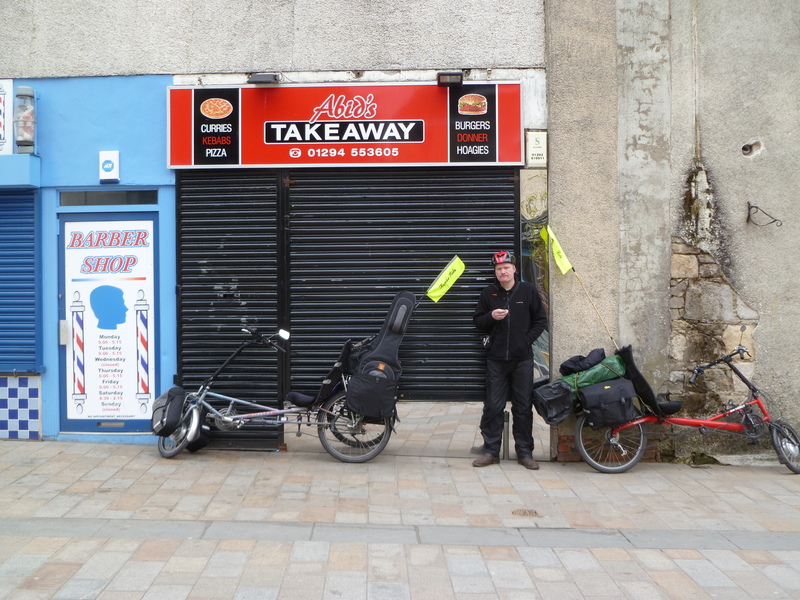 The next day we left for Ayr on a similarly crazy route. Spent most of thursday puffing up Glencoe the hill went on and on and then to our surprise on a bit more. Still it was wild and beautiful and it didn’t rain and we ended up in a rather shabby B&B in Crianlarich and headed past the pub that smelled of parrafin and the pub that smelled of paint to the Best Western hotel so over to our resident food critic Harry (the knife) Hymas. It seems it’s really trendy these days to elevate the more lowly and mundane ingriedients into something fit for high end dining – pork belly, bone marrow, sweet breads and the like. I’m all for this as some of these cheaper cuts are really tasty and I’m always skint. The culinary highlight of my week when I was at college was my pigs liver masala. 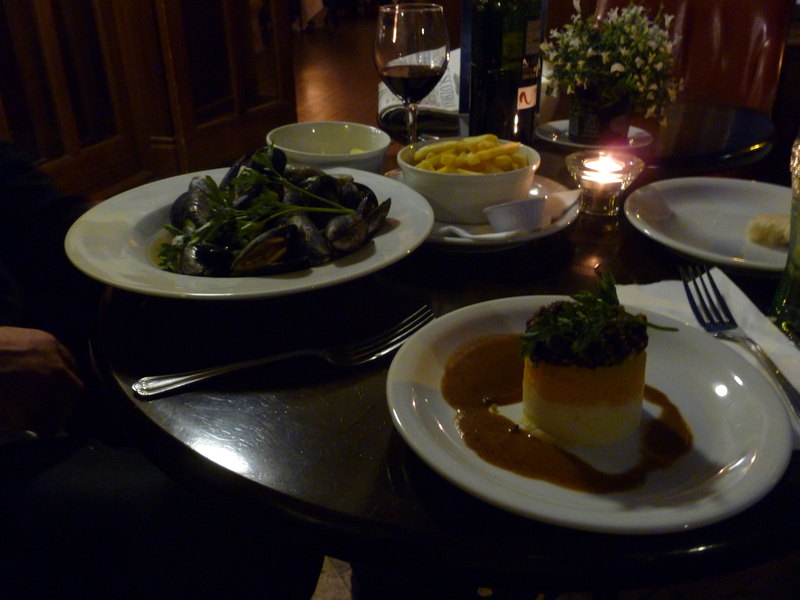 One of Pete’s dishes at the afore mentioned hotel was the famous haggis, neeps and tatties. I love this dish but when it came in the form of a Tian – mash at the bottom, neeps in the middle and haggis atop. It rather resembled a lighthouse surrounded by murky water and didn’t look at all appetising. ‘Oat cuisine’ at it’s most ridiculous. (see pic). Pete said it tasted ok after he’d seasoned it though not as good as the cullen skink that preceded it. I went for some Kinlochlan mussels which were small, juicy and delicious – not like those horrible green-lipped things that were so popular a couple of years back. Hey not bad for a Best Western. 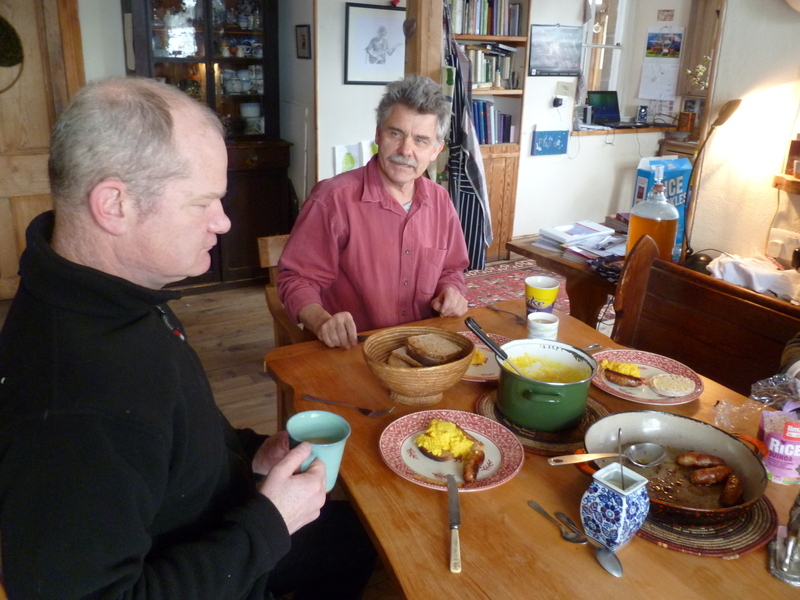 First off – a picture of breakfast at John Parrot’s ummm… home comforts. Next another corrugated masterpiece in Fort Augustas just after Loch Ness. We managed to grab a bit of canal towpath here but sadly only for 5 miles then forced back on the main road. 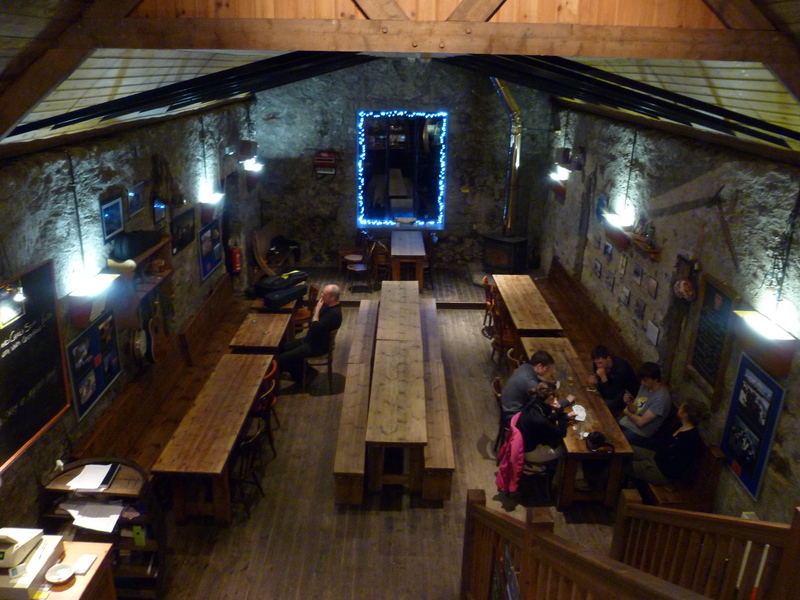 That night we ended up in the Ben Nevis Inn. 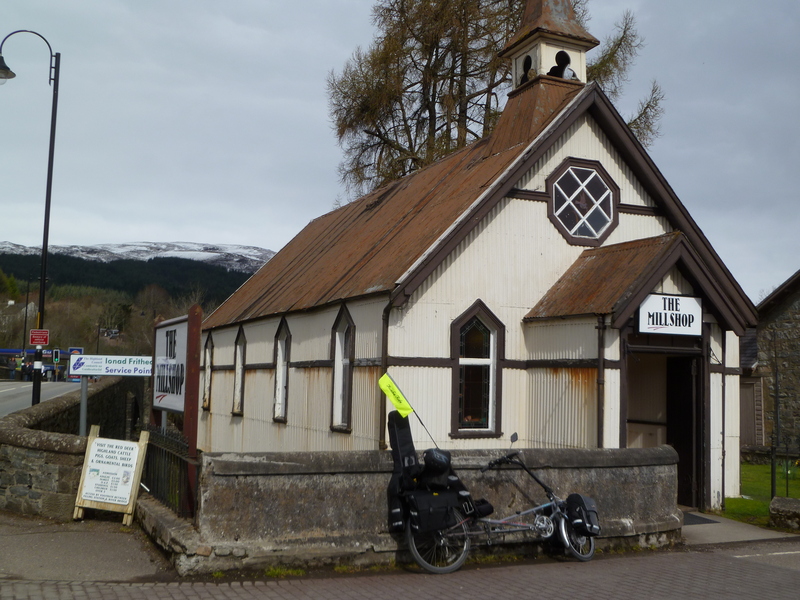 A licence to print money at the foot of Ben Nevis. 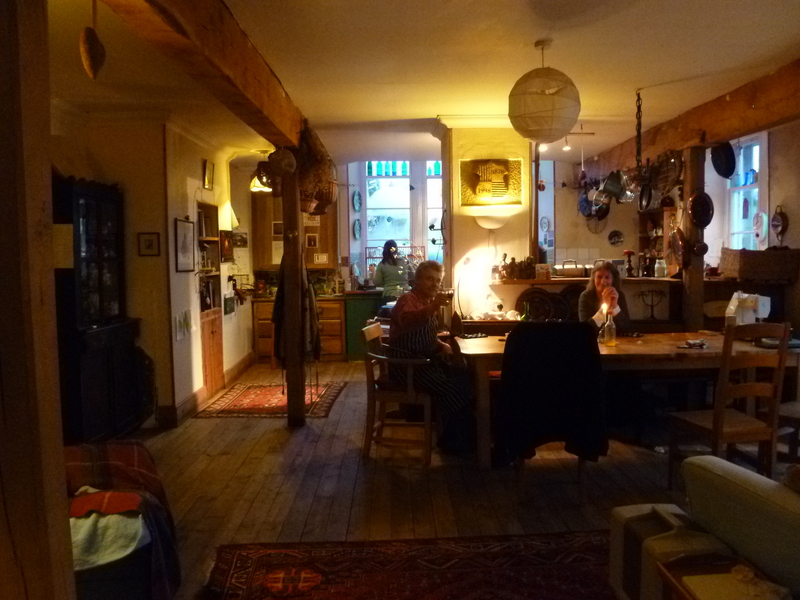 It consists of a Barn conversion with a fairly nice restaurant upstairs and a horrible bunkhouse downstairs where we were unlucky enough to spend the night (much moaning from the fiddler). We sang for our supper an excellent concoction of haggis,chicken,string beans and mash and were much appreciated especially by some passing Poles and here is a pic of the place after everyone has gone except John who is trying not to have to go to bed. Finally I must show you this mornings breakfast we sat down to in a funny little shop come cafe in Onich right opposite a hotel Alison had already stayed at (and hated). 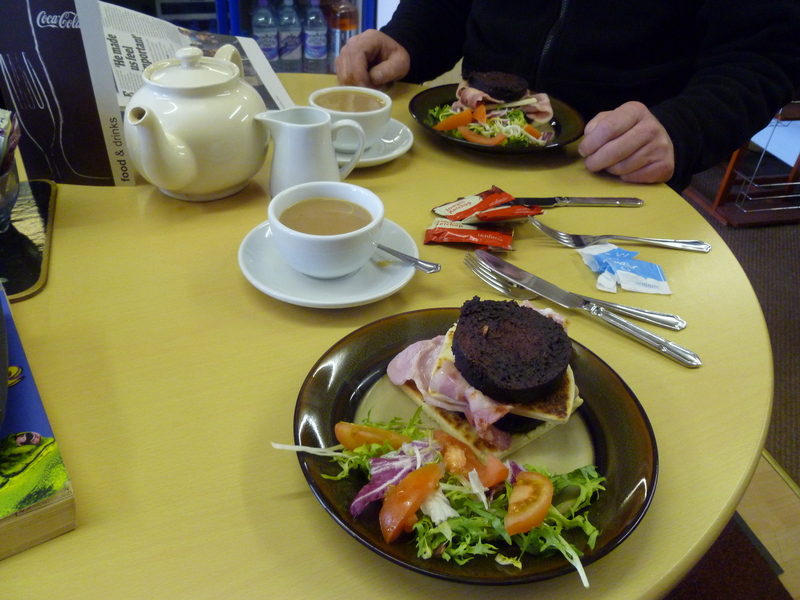 The object on the table is a black pudding stack – 2 slices of black pudding, 2 rashers of bacon 2 potato cakes with a ‘nice bit of salad’ on the side. Eat your heart out Tom Kitchin.